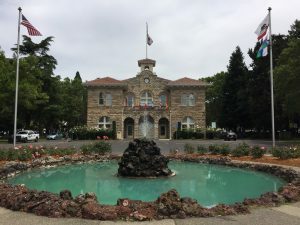 The Sonoma Plaza located in the heart of downtown Sonoma is an 8.5 acre oasis of lush grounds, with over 100 different species of trees, duck ponds, fountains, and rose gardens it is an idyllic place to visit. 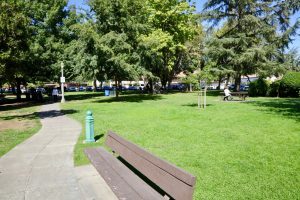 Special events held at either the Plaza or Depot Parks may not exclude the public from the use of the Parks. 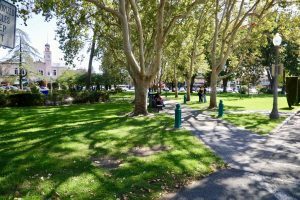 Please refer to the Special Events Policy that pertain to the specific park for restrictions, requirements, and guidelines for use. 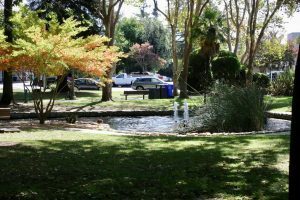 South West Quadrant is located in the front of City Hall on the west side and is approximately 55,000 sq ft and contains a lovely duck pond. This quadrant has a lovely tree canopy being one of the most shaded quadrants in the Plaza. It is ideal for those events that want a tranquil setting. South East Quadrant is located in the front of City Hall on the east side. This quadrant has a lovely rose garden and Italian fountain. The path that bisects this quadrant is lined by mature sycamore trees providing ample shade. North West Quadrant located in the rear of City Hall to the west is one of the largest open spaces within the Plaza. 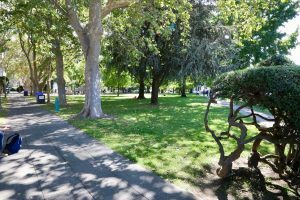 The North West Quadrant contains our small children’s playground, has a stand of trees however it also has a large open grassy area great for events that need a lot of open space. North East Quadrant located in the rear of City Hall to the east contains our older children’s playground. This is one of the smaller quadrants in the Plaza, it has a three picnic tables. This is a shady quadrant perfect for small family gatherings or those events that have a kid’s component. Grinstead Amphitheater is located on the east side of City Hall. It has seating capacity for 200+ people. 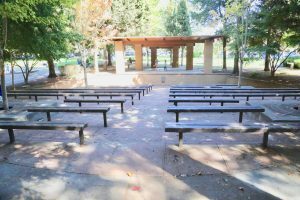 The Grinstead Amphitheater is a hardscape amphitheater with a covered, elevated stage that is viewable from every seat. The stage is approximately 29’ by 22’. The amphitheater is surrounded by Redwood trees that provide shade canopy over most of the seating. Front Horseshoe located right out in front of the iconic City Hall is one of two paved areas for rent within the Plaza. The front Horseshoe must remain open Monday thru Friday from 8am-5pm due to City Hall being open for business; however it can be rented for evening events and over the weekend. Rear Parking Lot located behind City Hall it is the second paved area for rent within the Plaza. The rear parking lot must remain open Monday thru Friday from 8am-5pm, however it can be rented for evening events and over the weekend. Occasionally, special permission is granted by the City Manager and City Council for use of the space during a period of time when City Hall is open for business.